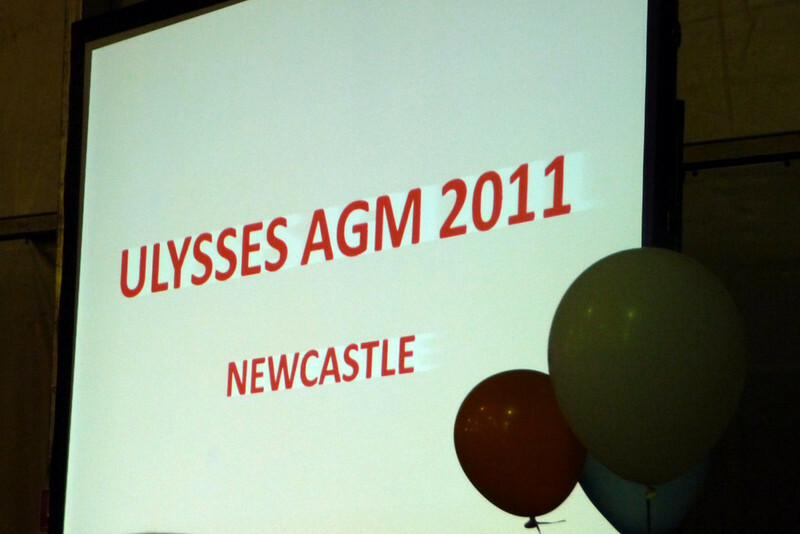 Checking in and registering my solitary attendance at the 2011 Ulysses AGM Event in Newcastle NSW, was greeted with sympathy and understanding. Without further inquisition I was immediately provided with a full refund of Ellen's registration fee, which was not an insignificant amount of $$s. 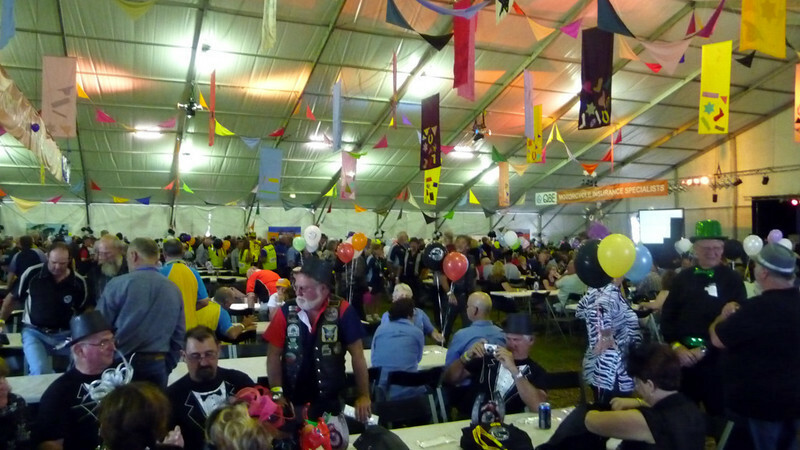 When I say 'older' I mean the over 50's brigade of the motorcycling fraternity. Needless to say that I, like the overwhelming majority of other Ulysseans, [ah-hem ..] had to lie about my age to become a member! Well ..
"Hasn't anyone ever told you about how to grow old gracefully? ..." !! 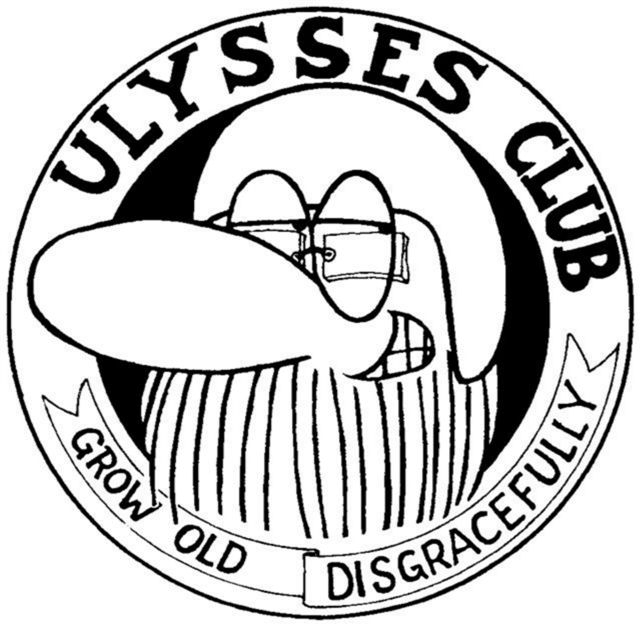 You can find out more about The Ulysses Club Inc. by clicking on this link. 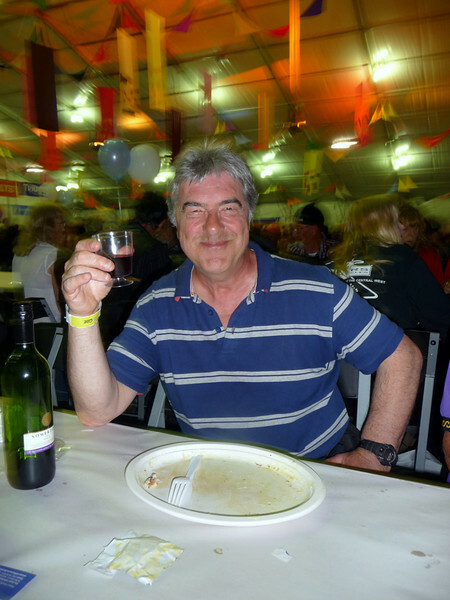 As one of only four international members at the gathering - out of a total attendance of around 3,000 - I was treated as a 'quasi' (not official) guest of honour .. and therefore granted honorary admission into the Club's Extended Natcom (National Committee) Meeting. 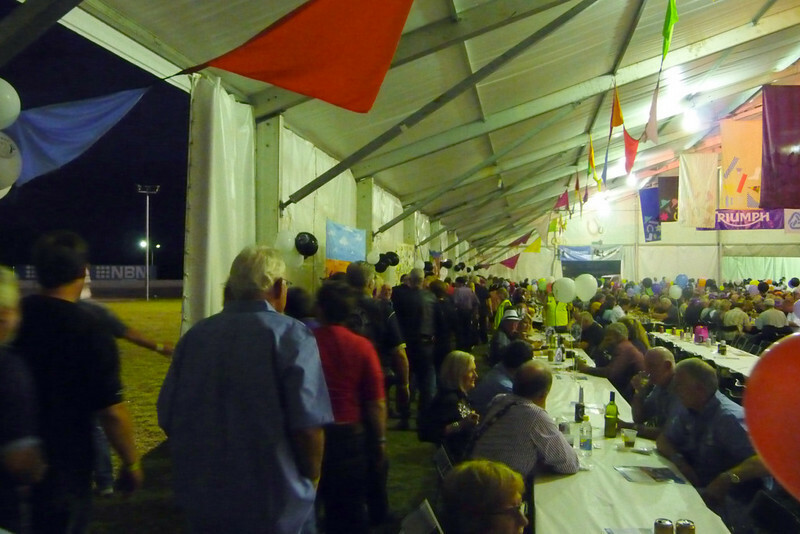 Inside the Entertainment Hoekker - a HUGE marquee tent - the organisers were able to admit and entertain 2,500+ diners .. with room to spare! 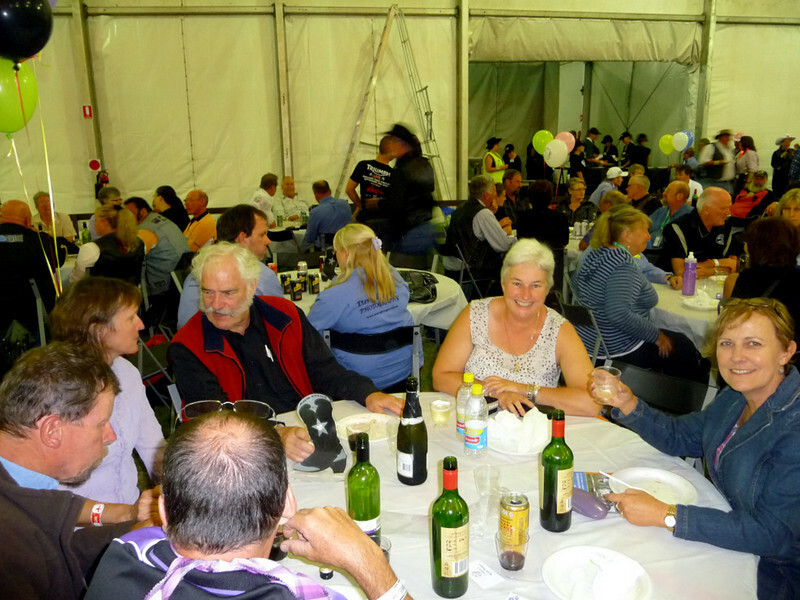 .. have you ever seen that number of hungry people all served-up with decent tasty tucker - in about 10 minutes flat? Well I did down under - during the nights of Fri-25th & Sat-26th March. A fantastic exhibition of top class catering for a huge mass of people. .. all washed down with a glass [or two] of red plonk from one of the local vineyards here in the Hunter Valley. 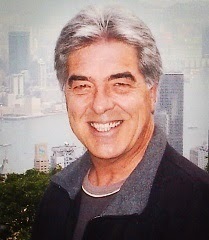 Thank you for taking my [above] picture potraits 'Garfield' .. sometimes known by her real name of Coby .. and thanks again to you [and hubby, David] and all the members of your family and circle of close cobbers who extended so much friendship to me. It made all the difference to what otherwise could have been quite a lonesome time. On Saturday night (26th), I was invited to join one of the top tables - probably the most prestigious top table of them all, the Dearnley Table - jointly hosted by Perry Stephens (International Liaison Officer); and Alexa Brown who is the daughter of the Ulysses Club founding #1 member, Stephen Dearnley. Needless to say, I felt very privileged indeed. With the Meeting mostly over, it was time to pack-up my mighty little tent, which had served me well over the last three nights, despite the variable (sometimes quite wet) weather conditions .. and go take a look around the city of Newcastle NSW. 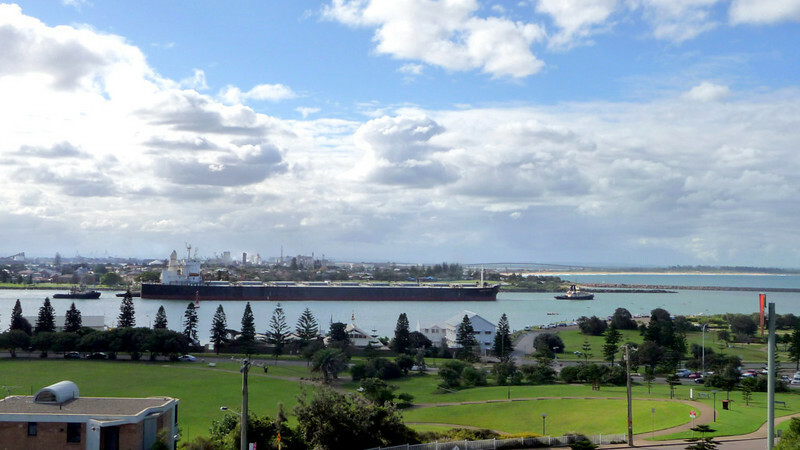 Famous for its coal, Newcastle is presently the largest coal exporting harbour in the world, exporting over 97 Mt of coal in 2009–10 with plans to expand annual capacity to 180 Mt by 2013. 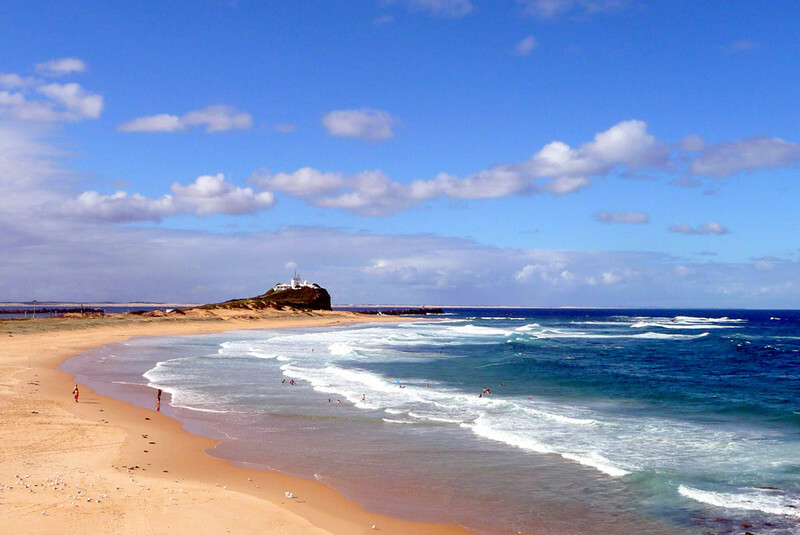 You can draw your own parallels with the UK's Newcastle Upon Tyne. Why Aye Man! 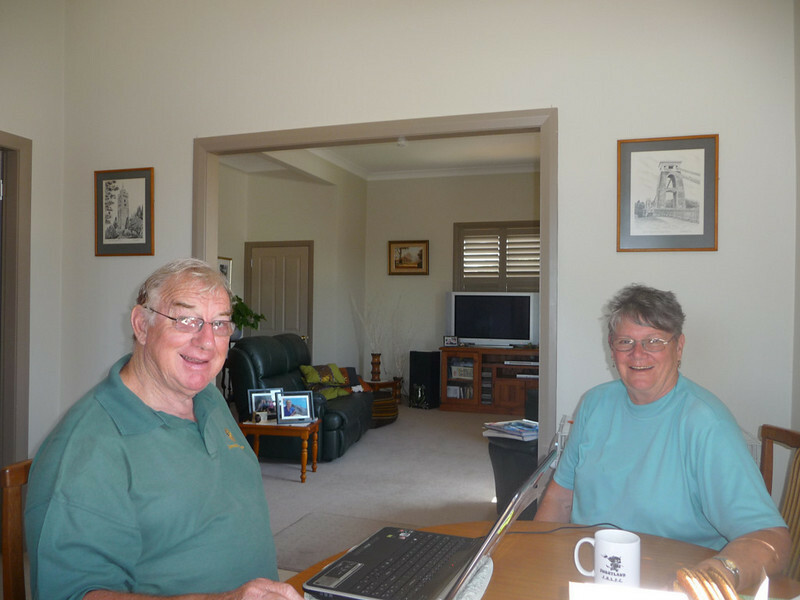 That afternoon I gratefully accepted an invitation to stay the night with Newcastle-based David & Lona [Brown], who are part of the Ulysses 2011 AGM steering committee .. and who both worked extremely hard to make the event a resounding success. 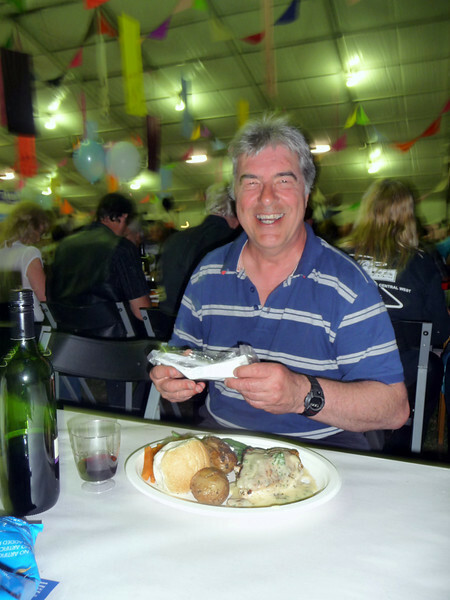 That evening the three of us, along with a few other local Ulysseans and AGM organisers, enjoyed a beer or two together - and a stonkingly good 'all-you-can-eat' buffet /smorgasbord at one of the local RSL clubs (Aus equivalent of our Royal British Legion). I ate too much, of course .. as every dish on display looked so tasty and appetising. I felt really at home staying with much travelled David & Lona - both fellow Westcountry folk (pommie emigrants) from Bristol and Bideford respectively - who went out of their way to make me feel welcome. So with the remainder of my route through NSW now fine-tuned and improved upon with Dave's local knowledge and assistance; plus my laundry all sorted by Lona ..
.. midday had arrived - and it was time to re-tension and lube the bike's drive chain .. and throw my right leg over the saddle .. and ride up into the NSW north-eastern tablelands. 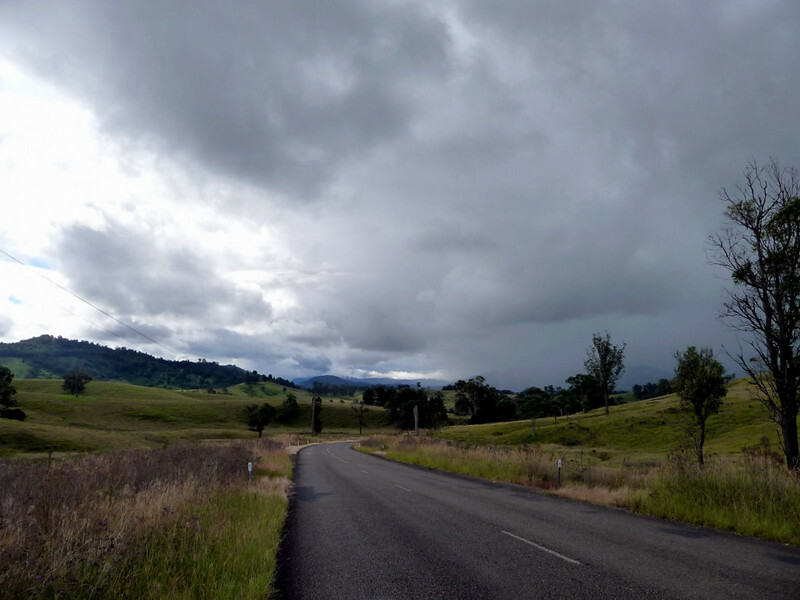 After a brief stretch of around 30 km [18½ mi] along the Pacific Highway, it was time to turn left onto the Bucketts Way, which for the first half more-or-less follows the Karuah River through a mixture of State Forest and open paddocks. Riding through townships with Westcountry [of England] names like, Stroud, Stratford and Gloucester - Dave did give me fair notice of this eventuailty - which gave me a bizarre feeling of comfort. Immediately after passing through Gloucester, however, there was a serious threat of rain on the horizon to my right. I pressed on for roughly a further 20 kilometres, until it became all too obvious that I was heading straight into a real drenching. So I did a U-turn, sharpish .. and scooted back into Gloucester where I booked a nice little motel room for the night .. Although the above video clip doesn't really do justice to the actual conditions - but trust me, it was lashing down. By the way, the whistler in the background is the manager's pet parrot. I blew him a short rendition of the 'Colonel Bogey March' - yunno the one .. with the lyrics, 'Hitler has only got one b@ll' - and Polly thereafter thought he/she was really onto something! 10:30am. Last night's rain finally abated .. and the sun started to shine through. Back over the Gloucester River and I'm away - Déjà vu. 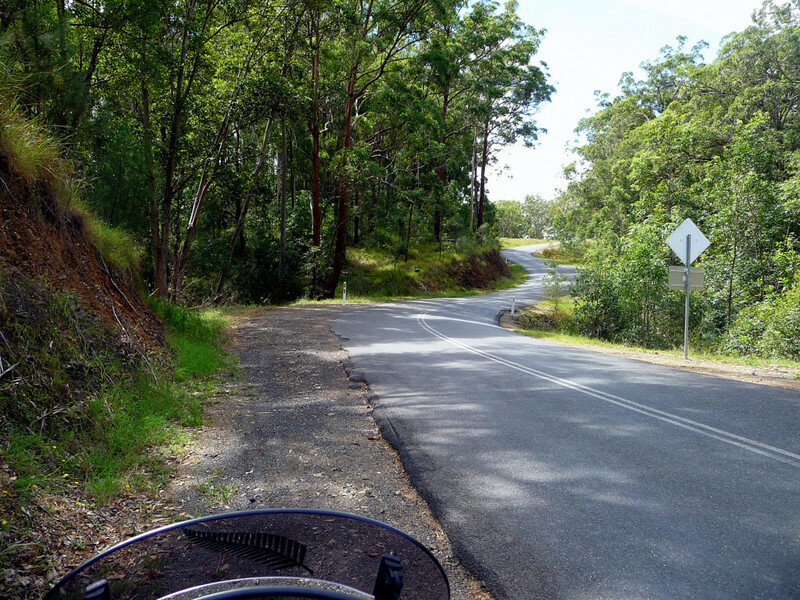 The road - called Thunderbolts Way - is like a giant roller coaster as it heads north to the Manning Valley, then up into the mountain range. 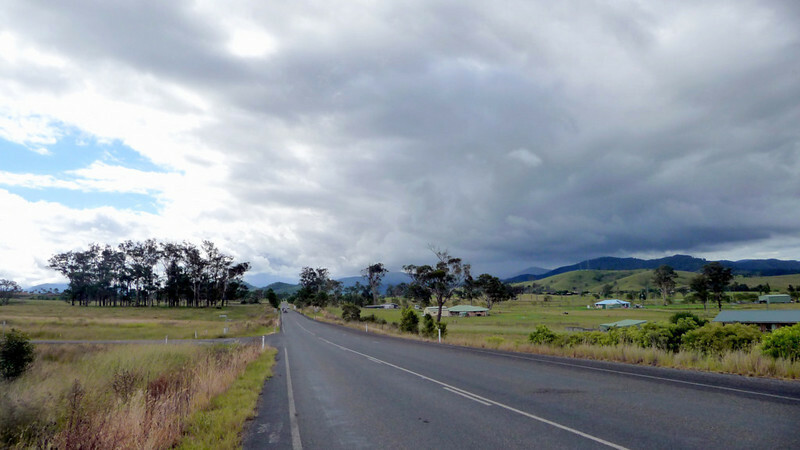 Up on the tablelands, the stretch of road into, and out of, Walcha township is narrow and its few corners are not so generously surveyed, especially from a motorcyclists point of view. But the threat of yet more rain was ever present .. and by mid-afternoon I had checked in, prematurely, at an Armidale-based motel. I had hoped to have made more progress, at least as far as the Nymboida Coaching Station Inn - another 150 km [93 mi] along the Waterfall Way. The weather, however, had beaten me yet again. An interesting and often well surfaced road - although sometimes horribly pot-holed, rutted and washed out! 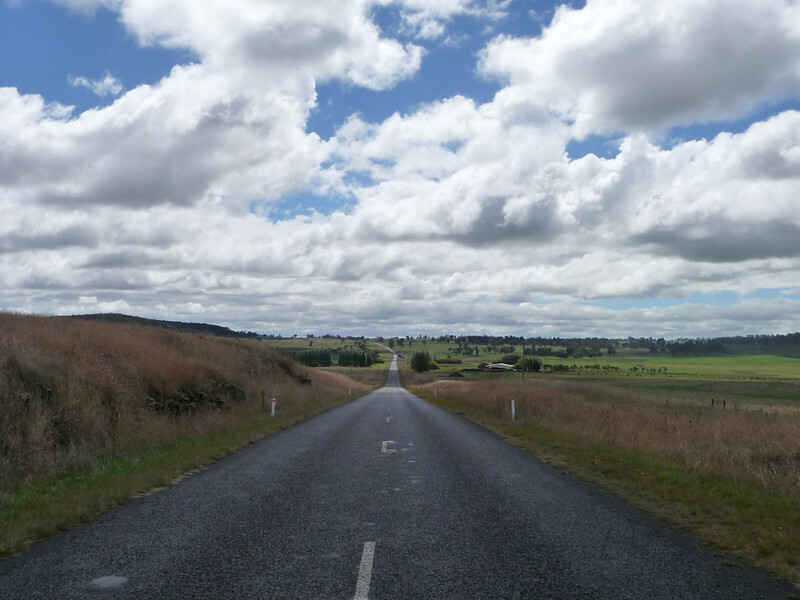 - that runs through a mixture of fertile tableland paddocks and lower thick forestry. 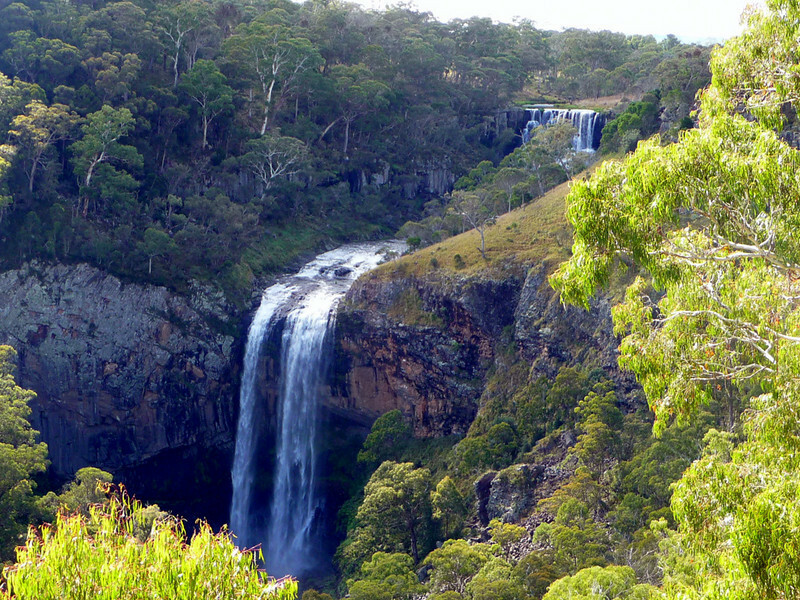 A couple of major waterfalls can be seen tumbling along this section of road through New England; most notably the Wollomombi and Ebor Falls. In view of all the recent rainfall over the last few day, weeks, months .. it occurred to me that these falls could by quite spectacular at the moment. I wasn't to be disappointed. The excursion to Ebor Falls was well worth the effort. Some decent twisty sections along the Way too. 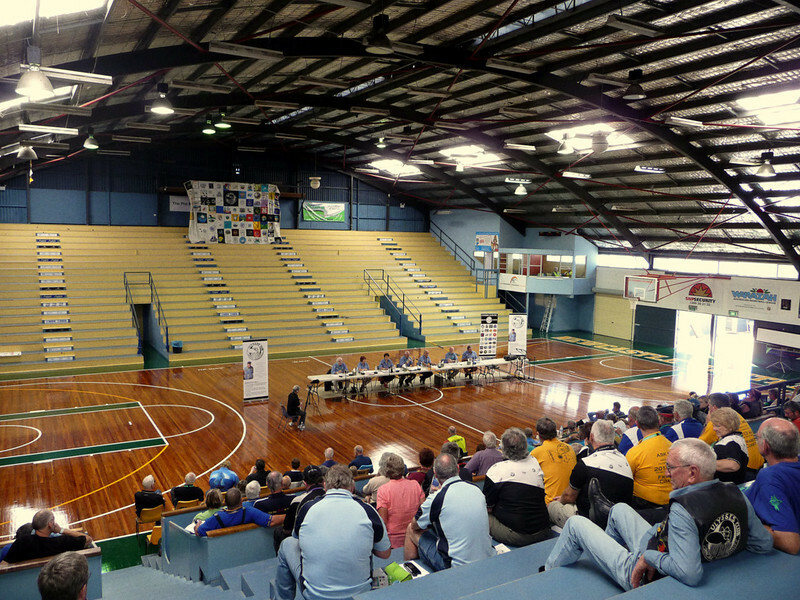 After passing through the major city of Grafton, the threat of rain again presented itself. Thinking I should really-very-bloody-quickly get my wet weather gear on again at this stage! I finally arrived in Byrons Bay, on the east coast, just before 5:00pm. 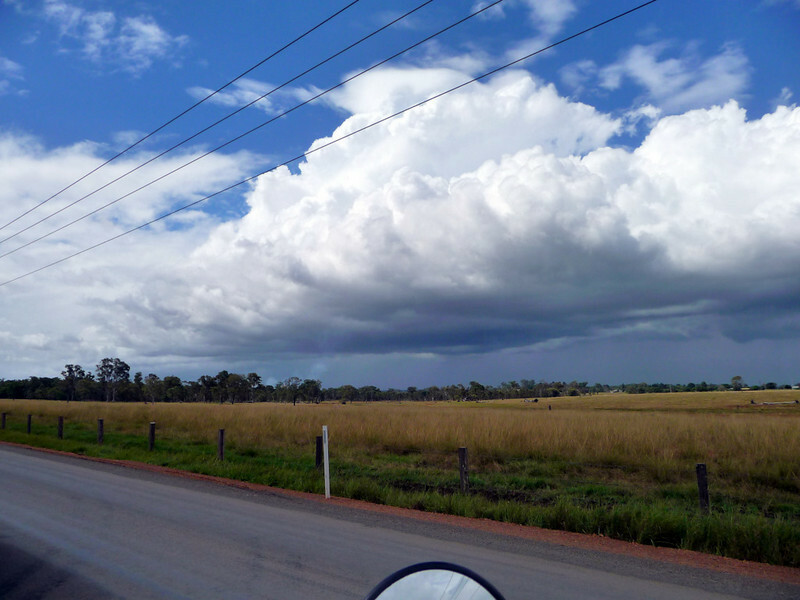 It did indeed rain - sometimes hard - all the way from just outside (the eastern side) of Grafton. Wet through again .. !! As you can see from the elevation profile above, my total 705 km [440 mi] dog-legged northern inland journey from Newcastle, all of a sudden became a very steep climb soon after leaving Gloucester, then a 200 km [125 mi] table-top ride, which eventually reaches a max. 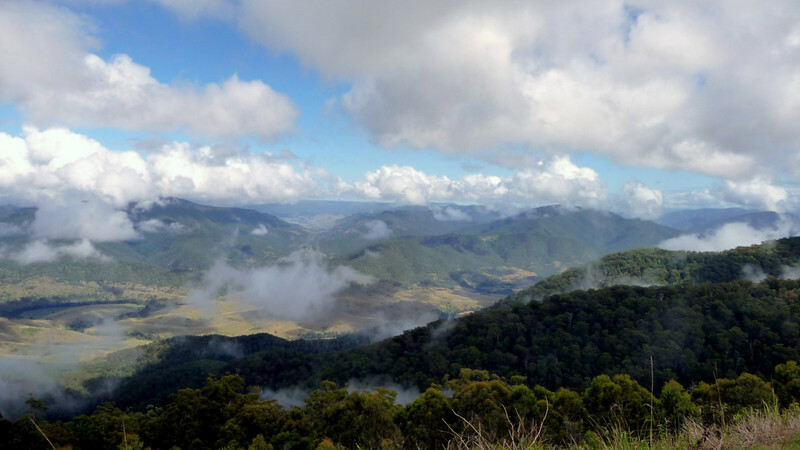 height of 1,370 m [4,500 ft]; followed by a fairly rapid descent back to sea levels approaching Grafton ~~> through to Byron Bay. 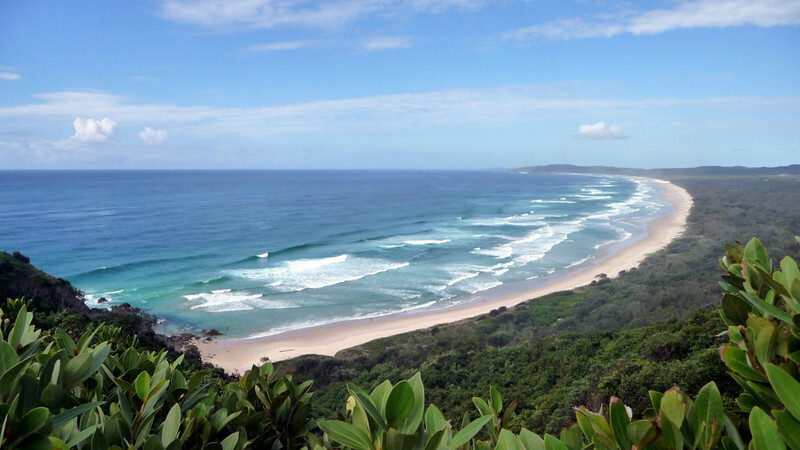 At the most easterly point of Australia's mainland, Byron Bay is famed for its surfing beaches, scuba diving, whale watching, rural beauty and a laid back lifestyle. In the 1970’s it was a hippie retreat - many partakers of which are still there to this day, but are now drawing their retirement pensions! Nowadays it's largely a surfer and backpacker “hang out”. 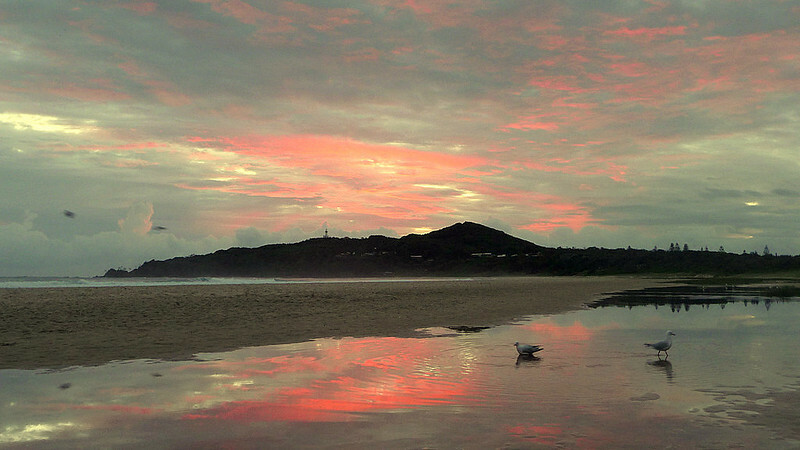 I'll confess that I felt like one of the ol' seventies farts during my brief one night stopover in Byron. I did take a little comfort, however, from knowing that Paul Hogan (Crocodile Dundee) and Olivia Newton John (a 1970s too-totally-gorgeous-for-words pop star/actress) used to live here. As I'm on the east coast, I thought it would be a good idea to get up early and try and capture some pictures of an aussie sunrise, as opposed to the typical sunsets I've photographed in the centre and west coast of Oz. 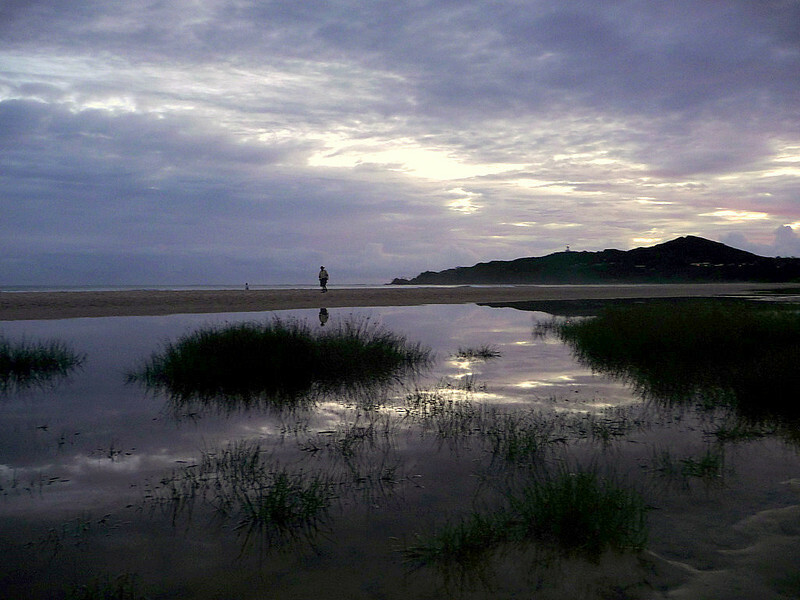 Here we are on the beach at pre dawn - around 6:30am. 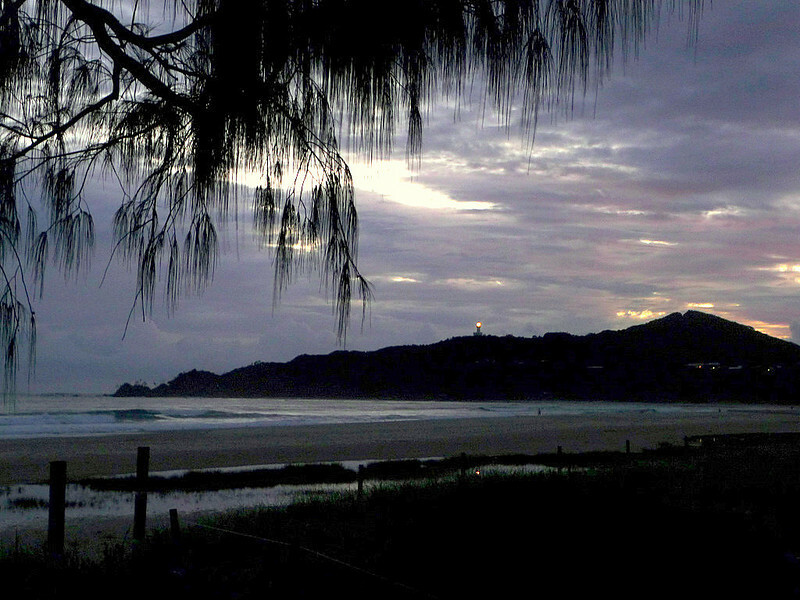 In the distance, up on the headland, the Cape Byron Lighthouse is transmitting it's characteristic white flash every 15 seconds. There are a few early morning joggers around; plus another circa 1960s-70s ol' hippie fart, with his metal detector, looking for buried treasures in the sand. 15 minutes later and the brief twilight period is well under way. Sunrise: at 06:53 am - this is as good as the red Rayleigh scattering gets, which lasts for less than a minute. A little bit disappointing perhaps? Maybe I'm just trying to be too clever, or too ambitious? .. with the wrong sort of camera, that's simply not up to the job of delivering the kind of pictures I'm trying to capture? Not enough depth and richness of colour, especially in low light conditions. I'm going to look into and investigate this aspect a little more when I get back home. New photographic equipment could be on the .. er - horizon .. later this year. 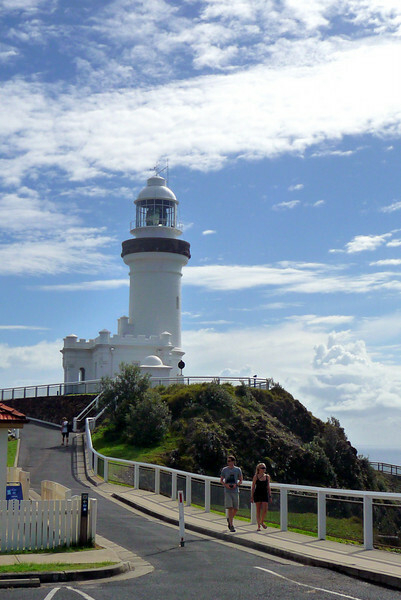 Later that morning I take a closer look at this quite famous landmark .. the Cape Byron Lighthouse. 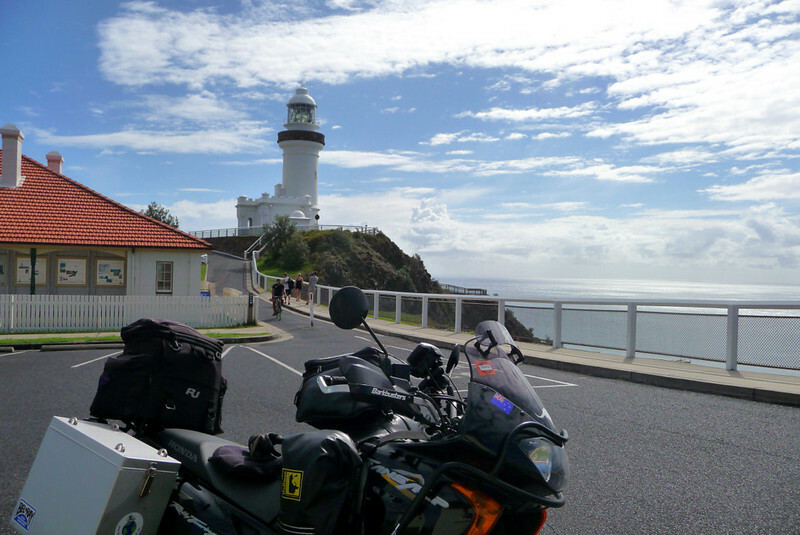 But if you have seen one lighthouse, then you've pretty much seen them all. As my Byron-based B&B could not accommodate me for a second night, which I would have liked; and because I just couldn't be arsed packing up and then unpacking all my gear again in new lodgings just down the street, I decided to push-on up the road a bit to the Gold Coast .. and to the township of Burleigh Heads in particular, which is where I was based during my 1994 visit to Oz .. just to see if I can still recognise anything ..
.. and in all honesty, I can't remember much. There's obviously been quite a substantial amount of construction going on hereabouts during the last 17 years. 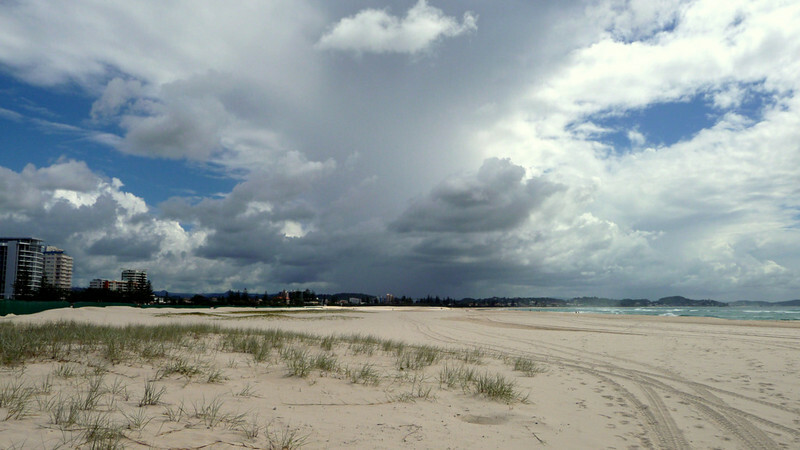 Turning the corner and crossing the state line into Queensland at Coolangatta, I soon realised two things; firstly that Queensland doesn't observe Daylight Saving Time, so I was running a whole hour ahead of local time; and secondly, there's the distinct likelihood of encountering a serious thunderstorm just up the road! By pure coincidence, I stopped right outside the Palm Beach Surf Club & Restaurant, where I clearly remember enjoying the best seafood platter .. ever - that comprised of: oysters, fresh king prawns, beer battered flathead, salt & pepper calamari, grilled Moreton Bay bug and half a crab w/ chips and salad. Took me 1½ hours to get through it all! 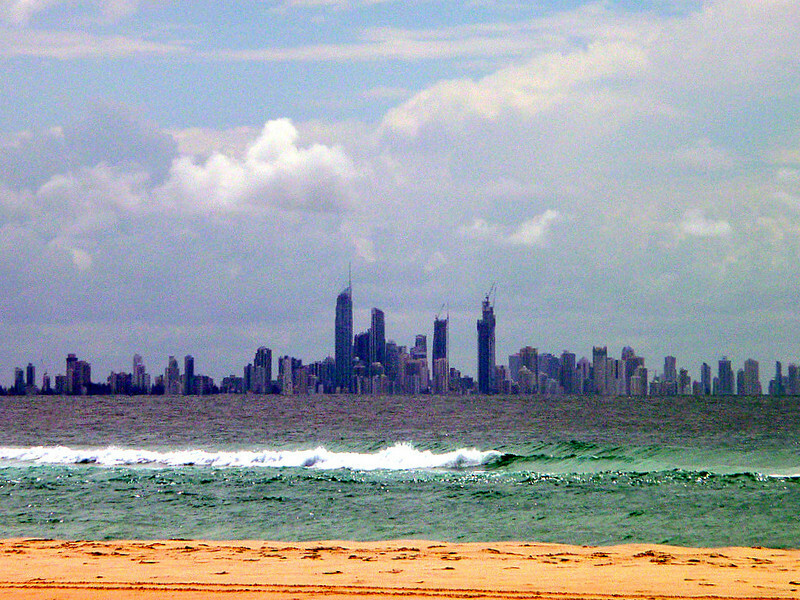 And it was from this spot that I looked across the Coral Sea to ..
the unmistakable skyline of Surfers Paradise. What a sh!thole .. !! It's entirely reasonable to describe Surfers as the 'Benidorm' or 'Torremolinos' of Queensland .. Barramundi & chips, washed down with a tinny of Castlemain XXXX is a very popular combo around these parts .. you get the picture? .. aw yeah, mate ..
To be honest, I couldn't wait to escape and see it all fade away in my mirrors. Paradise for Yobbos, more like! More news in a week's time ..
.. maybe even 10 days time - as I have an interesting 2-day excursion organised for next Mon-11 & Tue-12. 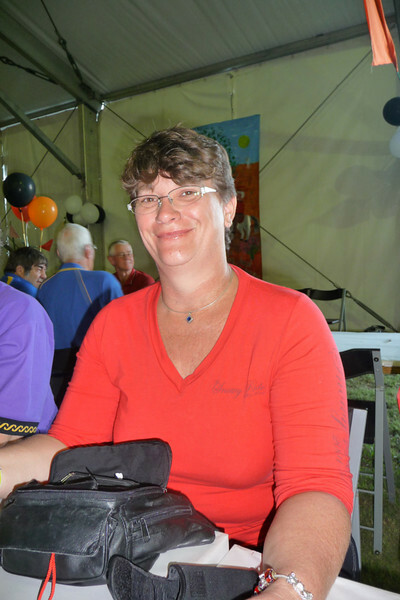 And finally, the good news: Ellen will be re-joining me on Monday, 18th April, in Mackay, QLD. 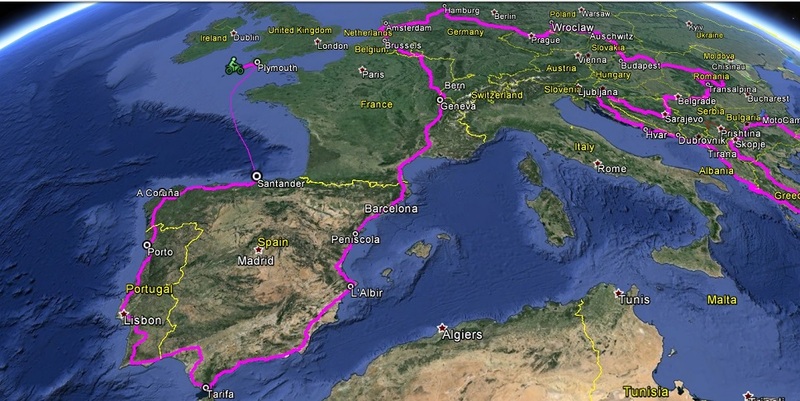 I shall collect her from MKY airport around 4:00pm that afternoon and we'll then continue on up the coast together. Our first extended stopover is likely to be Airlie Beach, which is the jumping-off point to the Whitsunday Islands .. and the Great Barrier Reef.